This article is the first in a four-part series that addresses the new tax law and some of the impact it will have on companies that purchase heavy equipment. This was an interview conducted by Mark Lempko and Don Pokorny, both of CCG, with Dixon Hughes Goodman LLP (DHG). The information conveyed herein is meant to be informative and should not be construed as specific tax advice. CCG: Given our customers’ considerable capital expenditure needs, what are the most relevant changes in Section 179 under the tax bill, generally referred to as the Tax Cuts and Jobs Act (TCJA or the act) as compared to the 2017 provisions? DHG: The Section 179 changes increase the amount of the deduction. Previously it was a $500,000 deduction limit, now it has been increased to $1 million. The Section 179 deduction is limited to small businesses, and that’s defined by the amount of property a business places in service in an annual tax year. Under the old law, you could place into service up to $1 million before that deduction starts to phase out. That phase out was increased to $2.5 million. 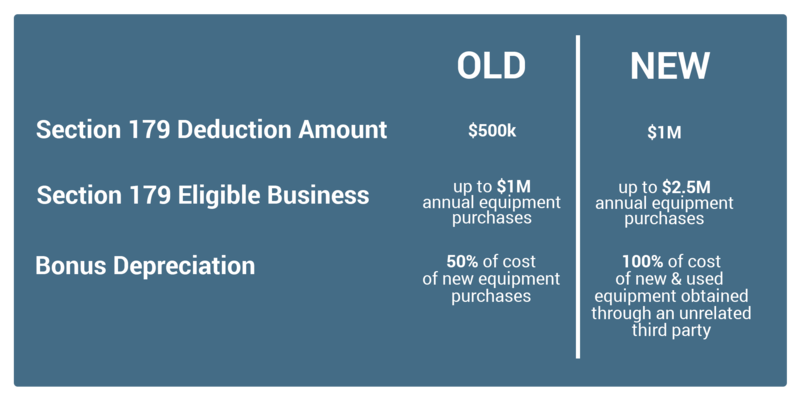 Once your customers start to spend more than $2.5 million for eligible property, which is typically equipment type assets, that deduction starts to phase out and is fully phased out at $3.5 million. CCG: So, it’s dollar for dollar when calculating the phase out? CCG: Can you comment on the modifications to the Bonus Depreciation provision in the act? DHG: There were two big changes, the first being that you can claim bonus depreciation on up to 100% of the cost of eligible property. Under the old rules, you could only deduct 50% of the cost, which was then scheduled to step down to 40%, 30% and ultimately 0 after 2019. With the new act the deduction was increased to 100% of the cost of eligible property. The 100% deduction will stay in place for 5 years, then it will start to step down each year after, and then sunset in 2026. The other big change is that previously bonus depreciation was only eligible for newly acquired assets. So, you had to be the original user of an asset to claim bonus depreciation, and they changed that rule so now you can claim bonus depreciation on used assets, assets you did not previously own. CCG: Is there any phase out or limitation in the realm of used equipment as opposed to new? Or, are the provisions identical? DHG: No, there is no phase out, you can deduct without limitation. It can create net operating losses (NOL), so if your deductions exceed taxable income then you’re just creating tax losses that you will carry forward to the future. But Section 179 does not work the same way – you can only claim Section 179 to the extent of your taxable income. CCG: If you generated an NOL, as a result you cannot use it, or does it pass through to the future? DHG: It passes through to the future. CCG: Are there time sensitive revisions here or is there a permanent carryforward that they can use for recognizing that? DHG: For bonus depreciation, there is a permanent carryforward as the new law was written. Those changes to bonus depreciation were effective as of September 27, 2017. So, if your customers purchased any assets in the last quarter of 2017, they could potentially claim the full expensing of bonus depreciation as long as there was not a binding, written contract in place to buy that asset before that date. CCG: Does that provision include used equipment as well? DHG: Yes. The Section 179 changes did not take effect until January 1, 2018. CCG: Are there any other modifications to standard depreciation once you have gotten through, whether it’s a 179 or bonus situation? Any other meaningful changes to the methodology? DHG: Bonus depreciation applies to used property, but it doesn’t apply when you’re buying assets from related parties. Related parties can’t swap assets and claim bonus depreciation again. CCG: OK, so if I had an equipment holding company, I couldn’t sell that unit to a related entity then restart my depreciation clock? DHG: Correct. They did that to prohibit people from basically churning assets within their own group. CCG: Yes, so to qualify, all purchases generally need to be from a third party, arm’s length transfer of an asset? DHG: I’ll define it a little more specifically as certain, but not all, related party ownership structures will disqualify an asset purchase from bonus depreciation. I don’t want to get too complicated, but if you have common ownership of companies, that’s going to be a problem. CCG: A lot of our customers buy large pickup trucks, and they fit into the broad range of “luxury vehicles”. Are there any luxury vehicle changes in these new laws? DHG: The depreciation limits were set lower under the old rules and were increased moderately not substantially. So, you can you deduct more for luxury autos under the new rules. CCG: And that must maintain 50% business use? CCG: Before we move out of Section 179 and the depreciation realm, any other comments under your part? DHG: There is something I’ll mention about luxury autos – you mentioned heavy equipment and heavy trucks. Those can carry some different rules than what I would historically call luxury autos. Another point I’ll add is that what I’ve heard in the industry as an acronym or catch phrase for the rules around equipment is that it must be “NEW TO YOU” in order to take a bonus depreciation. I’ve heard that from several different people. CCG: As an example, if a customer is acquiring a 2015 crane that has never been in his inventory, that would qualify for bonus depreciation although it is used? DHG: Correct. And if he/she did that after September 27th, it would be eligible as well. David Henderson is a Tax Partner with Dixon Hughes Goodman. He works exclusively with special financial services and specialty finance companies. Keith Davis works specifically in financial services, primarily with banks. He works with CCG on corporate tax matters for federal, state and international. Nathan Clark is a Tax Partner with Dixon Hughes Goodman in Charlotte, has experience in tax accounting methods and is heading up tax reform for DHG. Mark Lempko serves as the Senior VP of CCG’s Northeast and Canadian Regions with over 30 years of experience in the equipment finance industry. Don Pokorny serves as the Senior VP of CCG’s Central and Western Regions with over 30 years of experience in the equipment finance industry. He also is an Illinois licensed CPA..